Whether you choose our Rohde & Schwarz manufacturer calibration or a Rohde & Schwarz accredited calibration – you will always receive a service package that is more complete and comprehensive than what a pure service provider can provide. We offer attractive contract solutions for all our products. Our sales and service representatives will be happy to help you determine the right solution for your requirements. 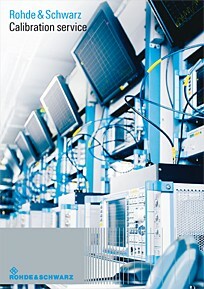 Rohde & Schwarz accredited calibrations ensure compliance with international standards and calibration data traceability. Many standards require accredited calibrations as proof of competence. Our accredited service centers not only measure accredited parameters, they also verify all product characteristics. A Rohde & Schwarz accredited calibration is as comprehensive and in‑depth as a Rohde & Schwarz manufacturer calibration, providing additional accreditation documentation. A Rohde & Schwarz manufacturer calibration ensures you a comprehensive range of services. As the manufacturer, we take care of all required adjustments, software updates and hardware modifications. We document each calibration with a certificate that contains both the initial and final status of your instrument. This enables you to evaluate your intrument's past performance and draw conclusions about future performance. Like all Rohde & Schwarz calibrations, the Rohde & Schwarz manufacturer calibration is based on national and international standards. We also service other manufacturers' instruments. As an equipment manufacturer, we know the relevant parameters for a definitive calibration. That is what makes us a competent partner for calibrating other manufacturers' instruments. During multivendor performance calibration, all required manufacturer-specified instrument parameters are measured. You receive a calibration certificate and documentation of measurement results. These services are also available as accredited services. Compare which calibration is best for you is right here in our comparison table. Accredited in line with ISO 17025 ✔ optionally accredited.